Tesla Charging Station Featured in Leader Times | Bradigan's Inc. When Armstrong County residents hear “Bradigan’s,” a few words likely come to mind — petroleum, heating and air conditioning. 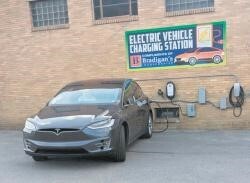 However, Bradigan’s Inc. now hopes “electric cars” can be added to that list, as the company recently installed two Tesla vehicle charging stations, as well as a universal electric vehicle charger, at their location at 503 S. Water St. in Kittanning. “When we decided to open this up to the public, we wanted to diversify our product offerings and service offerings,” said Andy Bradigan, the company’s corporate secretary. 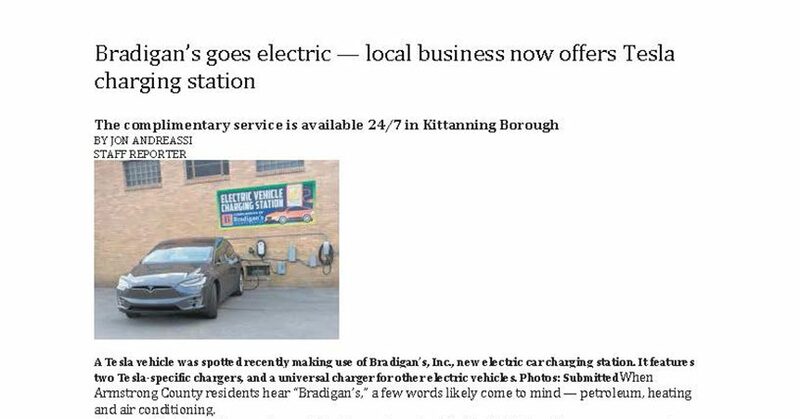 Bradigan touted the charging station not only as an expansion of their current services, but also as a draw to people who may want to travel to Kittanning and patronize local businesses. Indeed, the charging station is a complimentary service that is available 24/7, and was installed at no cost to Bradigan’s. Bradigan said the only cost the company incurs is the electrical fees from customers utilizing the chargers. According to Tesla’s website, outside of the immediate Pittsburgh area, there are charging stations in Indiana, Cranberry Township and Wexford. Bradigan is a member of the Entrepreneur’s Organization (EO), an international network of entrepreneurs which has a Pittsburgh chapter. Through the EO, he learned that Tesla will work with businesses to install the charging stations as a promotional tool, both for their brand and for electric vehicle use in general.